If Cupid used coffee instead of arrows, this blend might well be his weapon of choice. 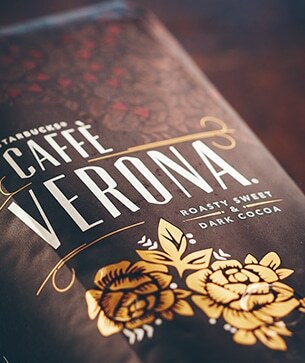 Caffè Verona™ is a seductive blend of beans from Latin America and Indonesia, with a gentle touch of Italian Roast lending depth, soul and sweetness. Because this delectable combination pairs so very well with chocolate, it has become a Valentine’s Day favorite – and the coffee we most associate with romance. P.S. : Literature lovers out there will recognize Verona as the city where Shakespeare set Romeo and Juliet. Although the play ends in tragedy, we’d like you to know that every cup of this coffee has a happy ending. Full-bodied and bold. Well-balanced and rich with a dark cocoa texture. Try it with a piece of dark chocolate to bring out even more sweetness.